Despite a growing population, planners say home ownership patterns are shifting and the region doesn’t need much more suburban single-family housing. Waterloo planners found home ownership patterns are changing — to the chagrin of builders. WATERLOO—A few years ago, planners in this booming region of high-tech startups and higher education did something so revolutionary — or ridiculous, depending on your perspective — that shock waves are still reverberating through the development industry . They looked at planning for the future from the perspective of aging baby boomers. For decades, new housing here, two hours west of Toronto, had been largely two-storey suburban homes on the farmland fringes. Some developments were sprawling so close to environmentally sensitive moraine lands and aquifers — on which the region depends for 80 per cent of its drinking water — that they ran into fierce community opposition. In 2008, a team of civic officials decided to take stock. They analyzed census data from 1991 and 2006 to classify existing housing in the region by age and type and, most importantly, by the number of people aged 50 and up, including the growing cohort of baby boomers, who owned it. “What we were trying to figure out was, how many single detached homes were still owned by baby boomers and how many will turn over and be sold in the next 20 years,” says team leader Kevin Eby, the Waterloo director of community planning and himself a baby boomer. What the team discovered was fascinating, if controversial, and has implications for cities across the country, especially when it comes to the growing number of empty-nesters: baby boomers whose kids no longer live at home. By 2016, this demographic is expected to account for about a quarter of Waterloo region’s roughly 500,000 population — some 129,000 people — up from just 79,000 in 2001. The housing study found older residents who lived in the city’s postwar bungalows, built between 1945 and 1965, tended to stay put into the final years of their lives. And if they did move out of those largely 1,200-square-foot two-bedroom houses, the census data suggested baby boomers often snapped them up. However, the first generations of suburban two-storey family homes — built starting in 1965 to house young baby boomers having families — were getting newer, younger owners at a surprising rate. The team found turnover as high as 30 to 40 per cent for those 2,500-square-foot-plus, three- and four-bedroom suburban-style homes as the first wave of empty-nest baby boomers started to hit their 60s. Out of that, planners came up with a theory: the region didn’t need a whole lot more subdivisions of single-family homes, despite the fact that its population is expected to grow by about 230,000 people by 2031. Baby boomers would supply those homes naturally as they age and … well, moved on to a higher place. 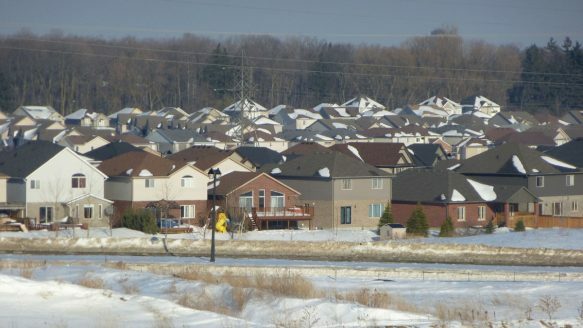 The study supported what the region had already determined during its official plan process in 2009: that Waterloo only needed to expand its borders by an additional 80 hectares to accommodate enough suburban homes to meet population growth. Instead regional politicians and planners believed the bulk of future housing had to be better suited to the region’s aging population: highrise and midrise condos close to stores, medical centres and amenities, where residents don’t have to climb stairs or do maintenance and no longer drive. Most of that development would be right downtown, along a new $818-million LRT line slated to open in 2017 that will connect the older cores of Waterloo, Kitchener and Cambridge. Home builders were not happy, especially those who had bought up farmland on the outer fringes in anticipation of continued suburban growth. They argued the region already has a serious land shortage that is choking off the supply of new houses, even as controversial semirural projects like Vista Hills, with 480 houses in the first phase of what could be some 1,600 homes, remain just 30 per cent sold after more than two years. A further 1,050 hectares needs to be rezoned on the fringes, they argued, to allow for enough single-family subdivisions. While Waterloo planners never formally published their housing stock study, it became a lightning rod nonetheless and one of the key issues in a hugely controversial Ontario Municipal Board decision in 2013 that backed the developers’ view. The ruling was seen as largely flying in the face of the province’s 2006 Places to Grow legislation, which is aimed at curbing sprawl and intensifying downtown redevelopment. The region appealed, and the case is still in the courts. While the ongoing appeal has technically left the region in a planning limbo, a very dramatic shift is already taking hold. In 2002, 73 per cent of all new housing across the region was traditional, single-family detached homes and 10 per cent was condos or apartments. As of 2014, just 25 per cent were singles and 42 per cent multi-unit residential. Already, condos and apartments such as the Barrel Yards project, right on the LRT line, are springing up in anticipation of future residents that the line is expected to draw. Among these new developments are Momentum Corp.’s Red Condominiums and The42, located just steps from the new restaurants, shops and bars transforming Uptown Waterloo. Both projects were aimed at the region’s large number of young, high-tech professionals, but the builders were surprised to find half their sales were to downsizing baby boomers, says Momentum partner Brian Prudham, 38. That’s despite a significant issue that could impede a mass move out of big family homes by baby boomers — condos here can cost almost as much as resale detached homes, which still average under $400,000. House builders are stubbornly clinging to a past that continues to destroy farmland and requires new roads, schools and other costly services that the region can no longer afford. If boomers aren’t yet moving in big numbers, it’s partly because alternatives like urban townhouses, condos and apartments have only recently even been available in the region. And they’ve largely been built by newcomers and builders from other cities who recognize the great need in Waterloo Region. Marian Kaska stands outside her home in Kitchener, Ont. Life now: Kasza and her husband looked long and hard 15 years ago for a reasonably sized house, where they felt they could live until the end, just like many of their neighbours. Kasza wanted a garden to fill her post-retirement hours, so a condo was unthinkable. Her husband has since passed away, but he prepared her well before his death for the one chore of home ownership she worried might be most unmanageable as she aged: He taught her how to use a snow blower. Ian Rawlings stands outside his Lakeshore home in Waterloo, Ont. Life now: With their child grown and gone, baby boomer Rawlings and his wife turned a spare bedroom into a home office and debated trading down to a condo close to theatre and restaurants. But they couldn’t accept the notion of trading their spacious $500,000+ home for a small condo that would cost about $375,000, plus hefty monthly maintenance fees — even if it meant never having to shovel their double driveway again. It’s too soon to know what they will do in the long run. Karen Scian stands outside her new apartment in Waterloo, Ont. Life now: This former Waterloo-area politician, entrepreneur and empty nester cashed out of her 2,800-square-foot, $500,000+ Laurelwoods suburban home last summer after her two children headed off to university. She felt the house market had reached a peak. Rather than put most of her cash into a condo, she joined the ranks of boomers opting to rent. She’s paying $2,000 a month to be within walking distance of restaurants, theatre and the new LRT stop right outside her door.